Seamlessly export captured emails and contact details to your MailChimp account. Connect your surveys to our MailChimp integration to export collected emails to your account and add new contact details. Collect data on your iOS or Android device, even if you're offline. Your survey will sync with MailChimp when you reconnect. Customize your surveys without needing to know a single line of code. Add your brand colors, upload your logo, and more. Transform your tablet into a kiosk to collect data at events. Instant notifications will alert you if your device stops working. Turn your MailChimp survey into a contest, giveaway, or sweepstake to encourage more signups and capture more leads. Tired of wasting time on low-quality contacts? Pinpoint quality leads by assigning different scores to each survey response. 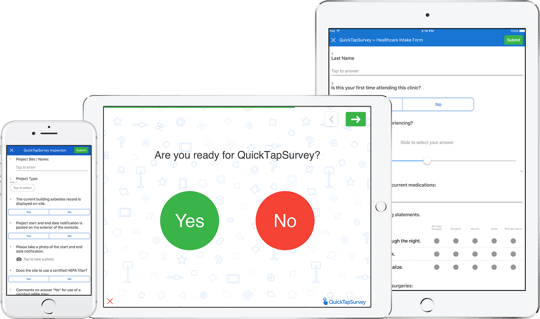 Over 180,000 people use QuickTapSurvey to capture critical business data and simplify their work. Up your email marketing game. Collect emails at events and store them in your MailChimp account for easy nurturing. Conducting a research project? Send submitted emails to MailChimp for future follow-up. Collect feedback on your services and send new contact details to your MailChimp account. Easily create a survey from scratch or use one of our ready-to-go templates. After you're finished setting up your survey, just connect it to our MailChimp integration and you're all set. See QuickTapSurvey's MailChimp integration in action by starting a free trial. No credit card needed.